New cars cheaper than used | What Car? What Car? has found that used car buyers might be better off buying new, especially if they have a car that's eligible for the government's scrappage scheme. Popular models such as the Fiat 500, Hyundai i10 and Volkswagen Golf can all be bought new under the scrappage scheme for less than a used version that's up to a year old. 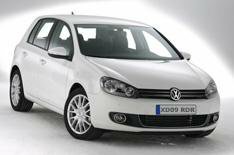 A used VW Golf 1.6 TDI S 5dr (59 plate, 200 miles) we found cost 16,200, yet the same car new is cost 12,430 under the scrappage scheme (including the available VW incentives). Similarly, a Fiat 500 1.2 Pop (08 plate, 23,000 miles) will cost from 6995, while the same car new costs 295 less with a scrappage grant. Even used car buyers who can't take advantage of scrappage should consider buying new in many cases the difference can be less than 2000 and that can be eroded further when the extra year's warranty and any low-rate dealer finance is taken into account. What Car? editor Steve Fowler said: It's a bizarre market this year: new car prices have already risen by 9.5%, but used car prices are an astonishing 30% higher than they were a year ago.